Did you know that missing even just one tooth has major implications for your oral health? Not only will your smile be incomplete, but your neighboring teeth will begin to shift into the empty space in order to compensate. This will cause your bite to become misaligned and increase your risk of permanent enamel erosion. Instead of putting your oral structures at risk and allowing your condition to worsen, you can work to stop this damage from occurring in the first place. Save money on future restorative treatments later by calling our office and asking about single tooth replacement in Orange Park today! Replacing a single tooth is done through two different methods. These include either a fixed bridge or a dental implant. 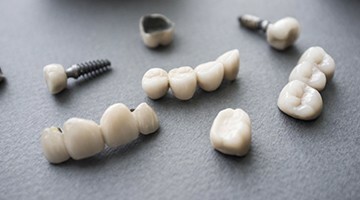 Fixed Bridge: Fixed bridges are the traditional method to replace the visible portions of missing teeth. To do this, Dr. Nawrocki attaches a dental prosthetic permanently to healthy existing teeth. This prosthetic consists of three crowns; one to replace the missing tooth and one on either side, which attach to two healthy teeth and provide necessary support. To do this, the healthy teeth are typically buffed down so they can properly hold the prosthetic and prevent common side effects tied to tooth loss, such as dental drift. After treatment, your smile will look natural and have its basic functions restored. 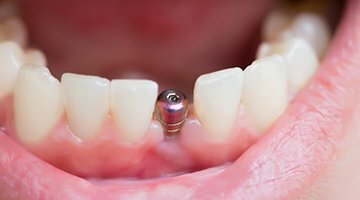 Single Tooth Implants: These take tooth replacement another step forward by replacing the root of teeth, not just the visible crown portion. A post made from titanium is surgically placed inside the jaw and below the gum line. Because the implant is designed to mimic the root and hold a restoration on its own, neighboring teeth do not require any modifications for this treatment. Keep in mind that dental implants are minimally invasive, despite the fact that surgery is needed to place them. After making a small incision, the gum tissue is opened and the implant is placed. While gum tissue heals generally quickly, the implant will take several months to heal and bond before a restoration can be placed. Once the implant is restored, it will function exactly like a natural tooth. Tired of looking at that open space in your smile? Don’t wait to prevent future oral health problems any longer. Contact Dr. Matthew Nawrocki to learn more about dental implants in Orange Park. Him and his team are fully qualified to replace teeth quickly and effectively regardless of the extent of your tooth loss.